We’re talking here about folks who listen to the Academy Award Winning Al Gore say trumped-up things about "global warming" like “the debate is over," and “the earth has a fever,” as he peddles his so-called "carbon offsets" from his own corporation- - and they believe it, every word of it, without question. The prescription, of course, frequently emanates from Hillary herself. It’s about the moral imperative incumbent upon all of us to curtail our consumption of natural resources, especially energy resources, and to reign-in the levels of pollution we create. Back in February of this year, a day after the Exxon corporation declared it’s biggest profit ever ($39 billion), Hillary used the occasion to both preach to the faithful AND take a shot at the entire petroleum industry (note: eco-centrists generally despise for-profit companies, especially oil companies). Now, it should be sufficiently alarming to any freedom-loving American that a major candidate for President actually believes that the profits of a private corporation are the President’s to “take.” But we can address Hillary's Hugo Chavez-style economic philosophy later. The point here is that as recently as three months ago, Hillary was reassuring the faithful of her desire to usher in an era of alternative energy sources (a vision put forth by President Bush in his past two "State of the Union" addresses) - - shareholders of oil corporations be damned. But given her public history of “prescriptions” - - for Wal-Mart, for Exxon, and for you and me - - what’s up with Hillary’s private, personal choices with her own consumption of petroleum products? The news that has emerged in the aftermath of the Democratic presidential debate in Orangeburg, South Carolina sure smacks of eco-centric "heresy." After flying from D.C. to the Thursday Orangeburg debate aboard a chartered Gulfstream II aircraft, Mrs. Clinton was then flown back to D.C. Thursday night after the debate concluded, aboard the same aircraft. After dropping-off Mrs. Clinton, the Gulfstream II was then sent back to Greenville - - with no passengers in it - - to await her return to South Carolina the next day. After a Friday morning speaking engagement in D.C., Mrs. Clinton boarded a private Hawker 800 jet, flew to Greenville, climbed back on board the Gulfstream II that had been waiting for her in Greenville since the night before, and took a short flight from Greenville to Columbia. Upon arriving in Columbia, Mrs. Clinton then boarded a Gulfstream III aircraft that she had ordered as an upgrade (“she didn’t like the configuration of the cabin” of the Gulfstream II), and flew from Columbia to California, while the Gulfstream II that she didn't like returned to D.C. - - again without passengers. Okay then. So, running for President is tough. And hard working candidates like Hillary need to be comfortable, aesthetically, physically, and otherwise, and they need to stretch out and relax in the air. Maybe even talk candidly and privately in between the campaign stops. That’s all perfectly understandable. But the question is this: can Hillary Rodham Clinton, suffering as she is with a “I’m not charming like my husband” problem, afford to continue alienating the extreme left-wing of her own party? She is already paying the price with the anti-war contingency for refusing to renounce her vote for the use of force in Iraq. 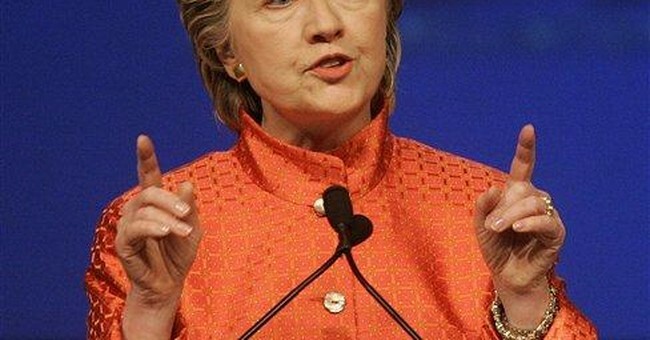 If Mrs. Clinton continues to ignore her own eco-centric orthodoxy, and refuses to allow herself to be even a slight bit inconvenienced for the sake of the greater environmental good (as she asks the rest of the country to do), she could find that her political future may very well NOT lead her to “greener” pastures.